PlatformIO is independent of the platform, in which it is running. In fact, the only requirement is Python, which exists pretty much everywhere. What this means is that PlatformIO projects can be easily moved from one computer to another, as well as that PlatformIO allows for the easy sharing of projects between team members, regardless of operating system they prefer to work with. Beyond that, PlatformIO can be run not only on commonly used desktops/laptops but also on the servers without X Window System. While Platform IO itself is a console application, it can be used in combination with one’s favorite Cloud & Desktop IDE or text editor such as PlatformIO IDE for Atom, CLion, Eclipse, Emacs, NetBeans, Qt Creator, Sublime Text, VIM, Visual Studio, VSCode, etc. Alright, so it can run on different operating systems. But more importantly, from a development perspective at least, is a list of supported boards and MCUs. To keep things short: Supports approximately 200 Embedded Boards and all major Development Platforms. Developer can compile the same code with different development platforms using the Only One Command platformio run. This happens due to Project Configuration File (platformio.ini) where you can setup different environments with specific options (platform type, firmware uploading settings, pre-built framework, build flags and many more). 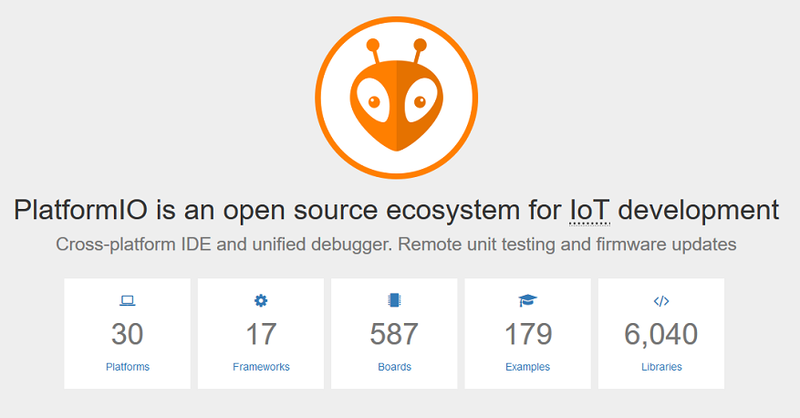 Based on this list of boards, Platform IO downloads required toolchains and installs them automatically. Users develop code and Platform IO makes sure that it is compiled, prepared and uploaded to all the boards of interest. This is the next-generation integrated development environment for IoT. Integration components (Cloud & Desktop IDE and Continuous Integration). This Tool is written in Python 2.7 and works on Windows, macOS, Linux, FreeBSD and ARM-based credit-card sized computers (Raspberry Pi, BeagleBone, CubieBoard, Samsung ARTIK, etc. ).